Here at Fairview we grow a large number of vegetables and herbs. Tomatoes, peppers, cucumbers, melons, eggplant, rosemary, basil, thyme, cilantro……the list goes on and on. We also carry a great selection of small fruits that can be planted in the landscape and enjoyed year after year. This article will focus on the top 4 easy to grow plants that will add a little “flavor” to the landscape. Blueberries are one of the easiest edible plants that you can grow in your home landscape. Three things to keep in mind when selecting an area to grow these plants are sun exposure, drainage, and soil pH. A well drained spot in a full sun space will be loved by blueberries. Double check your soil pH before planting. Most of our trees and shrubs perform best when the pH is around 6.0-6.5. Blueberries will absolutely grow under this condition but prefer a lower pH around 5.0-5.5. Lowering soil pH is a relatively easy task but it can take a little time. Applications of granular sulfur are the easiest way to lower pH here in the piedmont. The three most popular blueberries that we carry are ‘Tifblue’, ‘Climax’, and ‘Premier’. These three are all Rabbiteye types which have a higher heat and drought tolerance than their Highbush cousins. Planting multiple plants is best for higher yields and mixing these three cultivars is the best recipe for large harvests and extended harvesting seasons. Keep an eye on the birds……..they will try to beat you to the fruit! Plastic netting is the best way to deter them. The fall color of the foliage is often never discussed but it’s quite striking! Like blueberries, figs are an easy addition to your small fruit landscape. The only issue that we occasionally see with fig here in Wake County is cold damage. Figs can be grown as either large shrubs or small trees depending on how much space is available for them. 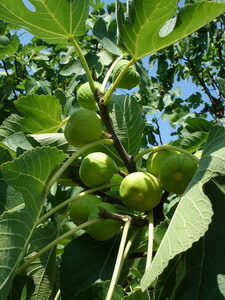 Full sun and well drained soils are the only requirements to grow figs. They are self fertile plants that do not require pollinators. ‘Brown Turkey’ is by far the most common cultivar found but occasionally ‘Celeste’ makes it way into the garden center. ‘Brown Turkey’ has a larger fruit and tends to hold up better in preserves. ‘Celeste’ has a smaller fruit that some say tastes a little better. Blackberries require a little more work from the gardener but have no major pest or disease issues in our landscapes. Many thornless varieties have been developed and introduced by NC State which makes working with blackberries a lot easier than it used to be! 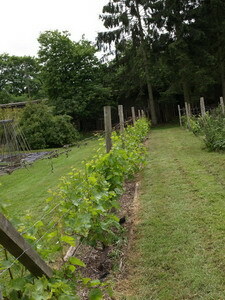 You will want a trellis system for support of blackberry plants. Which type of plant you select to grow (trailing, semi-erect, and erect) will determine how much space you need for growing blackberries. Trailing plants will take more room than erect forms. Again, full sun and good drainage are key for top notch fruit production. ‘Apache’, ‘Navaho’, and ‘Arapaho’ are some of the more popular NC State introductions. By far, the easiest type of grape to grow here in Wake County is the muscadine. Traditional bunch grapes can and will grow here but require much more care to make it through our heat and humidity during the summer months. Our recommendation here at Fairview is to stick to muscadines as they are much more heat and drought tolerant as well as much more resistant to pests and diseases. Muscadines are also called Scuppernong grapes by many. Technically, ‘Scuppernong’ is a single unique type of muscadine identified in the early 1700’s but over time “scuppernong” has been used to identify most all bronze muscadine type grapes. Like our other fruits listed here, sun and good drainage are a must for plant health. ‘Carlos’ and ‘Triumph’ are two bronze cultivars that we carry while ‘Noble’ is a black. All three are tasty when fresh and can be made into wine. These are just a few of our favorite easy to grow small fruits. You will notice the absence of fruit trees on this list. Apples, pears, peaches, and plums can absolutely be grown in our area. They do require a little more care than the plants on the list though. These plants could be a topic for a future article so keep your eyes open. For more details on blueberries, figs, blackberries, and grapes, call us at the garden center or check out the NC State fact sheets online.